It’s true what they say, though. Phase I is tough. But, I digress. What is actually working for me has to do with the Curves shake. What you might not know about the 6-week Solution is that it comes complete with this optional protein shake that one may enjoy once a day. Although no one would say it at the first class, it seemed to me from what they weren’t saying that one might not actually enjoy the shake if one merely stirred it with a spoon. The common advice was to acquire and use a Curves shaker cup, kind of like a martini shaker only not, or to use a blender. Yes, well, therein lies the problem. I’m not going to shell out cash for the shaker yet because I’m not sure how much more money I want to invest in this; besides, money is tight in Casa Texture right now. Also, a blender? Sure, I have one, but that doesn’t mean I’m going to pull it out every day for one shake, and I have no counter space. Also? I am the laziest person I know**. I don’t want to wash the thing if I don’t have to. The first night of the diet, I mixed my shake powder into the milk with a spoon, like I would make a glass of Kool Aid: put in powder, add fluid, stir. The resulting shake had a top, floaty layer that was simultaneously gritty and foamy. I could see where the Curves rep was coming from. I did not enjoy that night’s shake. The second night, I employed a method I think I saw on an episode of Good Eats. I put the powder in the glass. I add just enough milk to make a thick paste from the powder. Stir, stir, stir hard. Get all the powder into the paste. I have found over the last few days that about 2 ounces of the total 8 is just about right, creating something about as thick as homemade chocolate cake frosting. (Mmmmm, frosting…) Then add the remaining milk and stir together briskly. The result? No grit anywhere in it. No foamy layer. No clumps of unstirred, unbroken powder. It tastes pretty good, actually, a whole lot better than the powder smells, to be sure. And, I don’t have to clean any contraption of any kind to do it. I just need a spoon. I have since tried this with my daughter’s Ovaltine, and it works there, too, although I never had quite the problem with Ovaltine as I have with the shake. 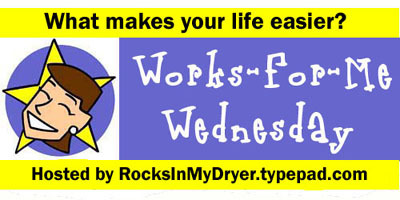 Hop on over to Rocks in my Dryer for this week’s Works for me Wednesday, a “Best Of”! **I’m lazy, but I’m honest.